This disease has almost completely wiped out the American Chestnut tree. As a fungus, it spreads by producing spores. No cure currently exists for it. Another fungi, this disease occurs in almost every state in the US. It attaches to trees that have already experienced compromising factors (such as competition, severe climate, etc), killing them or making them susceptible to other fungi. Because this disease starts at the root, it often requires a professional to diagnose. This disease presents itself most commonly as dead blotches on a tree’s leaves. 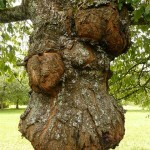 It has attacked hardwood trees most prominently, causing damage in many urban environments. If you should suspect that your home’s trees have gotten sick, call in a professional to inspect them. Here at Integrity Tree Care, we can happily do that for you. For more information, please give us a call at (817) 714-1777 or (214) 971-1618.